If you want to see any planets this month, wake up before sunrise. I was up early this morning (Friday) and noticed the skies have cleared over Chicago, at last. Over the next few days, the waning crescent Moon is going to “visit” three planets visible in the morning sky before sunrise. 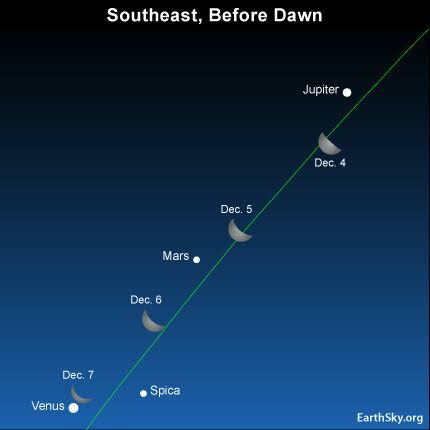 This morning, the Moon was right next to Jupiter, the second-brightest of the three planets in the sky. This weekend, the Moon will be next to Mars, the least bright of the morning planets. Finally, on Monday morning, the Moon will be next to Venus, the dazzlingly bright planet that was once known as the Morning Star. The Moon and planets in the morning sky, courtesy of EarthSky.org. Note how much farther apart these three planets are now as compared to what they looked like in early November, the last time the Moon was in their vicinity.